Art & Framing Gallery ,becoming a professional artist eight years later at the age of twenty three. Angela lives in Emsworth –a fishing town on the south coast of Hampshire with her husband Roland Rogers and their son Peter , and continues to paint under her maiden name. Angela finds her inspiration from the surrounding coastline and countryside . Working in watercolours ,oils and acrylics, capturing it’s atmosphere, moods, natural colours and effects of light , though out the season’s. Her commission work also include birds, animals, garden and architecture. Her work has been exhibited with The Royal Institute of Painters in Watercolours at the Mall Galleries London. 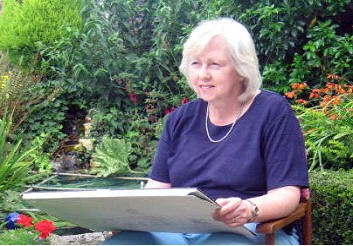 Held a number of successful solo exhibitions and won awards in National and International watercolour competitions. Angela’s work is represented in public, and in private collections around the world.